Wilson Lake offers good boating. This 4.5 km long lake is deep and narrow. Most of the shoreline is steep and accessible only by boat. The recreation site, on a flat at the east end of the lake offers a large open area, with the campsites around the edge of the clearing, ideal for group gatherings. Trout fishing in the lake and in Fitzstubbs Creek can be rewarding. Miles of forestry roads in the vicinity are popular with bikers and ATV users. Driving Directions:Access from Rosebery: Turn off Highway 6, at Rosebery, onto the “East Wilson Creek Road”. This road soon turns into the “Wilson Creek Forest Service Road”. Follow this good 2 wheel drive gravel road. At 5 km the road forks, stay left. At 33 km a dirt road crosses the “Wilson Creek Forest Service Road”, continue on the gravel road to the left. “Wilson Lake East Recreation Site” is straight ahead, at 34 km, just before the road crosses a bridge over Fitzstubbs Creek. 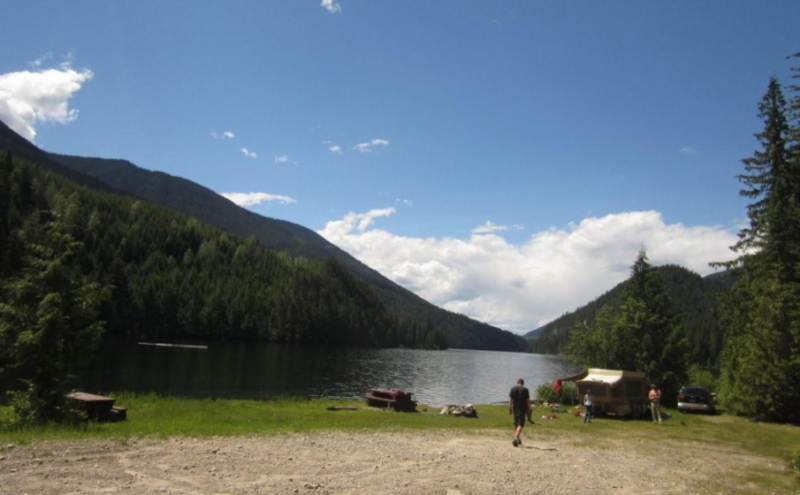 Access from Nakusp: From the junction of Highway 6 and 23 in Nakusp, travel east on Highway 6 towards New Denver for 6.3 km. Turn left onto the “Wilson Lake Road”. Take this good 2 wheel drive, gravel road up Wensley Creek, past the sawmill. 7 km up the road, turn right onto the “Wilson Lake Forest Service Road”. Follow this rough 2 wheel drive road for 7 km, as it climbs steeply over the rocky bluffs south of Wilson Lake. Several spur roads come onto it from the right. Stay straight ahead at all of these, eventually descending to the shore of Wilson Lake. The recreation site at the end of the lake, is visible across the lake, from the last steep descent.